Artful Affirmations: Tea Cup Tuesday-Yea! I am happy to share another tea cup with you as well as a little history behind tea and tea cups. From a little research I have found out that the tea cup has developed in England in response to the newly available tea from China. Before this time, only coffee and chocolate were availabe (early to mid 1600's). King Charles II queen was from Portugal and already knew about tea, and talked her husband into finding a way to bring it to England. So tea came to England in the 1660's. Tea was very expensive and cost from 6 to 10 British Pounds per lb, and that was in the late 1680's! Imagine that! The cup itself seems to have started out as handle-less cups and the saucers with tall sides. The British did not like this at all and eventually, developed a handled cup and a shallow saucer. But it wasn't until the 1740's that they developed a "soft paste" that could produce pottery anything like Chinese porcelain. By 1815 a "hard paste" had finally been developed that made fine white "bone China", by adding calcined animal bones. Adding to that, taxes on tea had been cut, making it possible for more people to afford it. Pottery factories grew and many of the companies we see backstamped on our antique cups sprang forth. This is just a small snippet of the information that is out there about the history of tea and tea cups. I hope you enjoyed it. Now, on to the cup! My cup this week is new to my collection. I fell in love with the bold colors and the simple earlier version of the rose. I also really like the gold trim. This cup has a really good feel, the handle and weight are just right. This may not be my most gorgeous cup, but it is really comfortable to drink from. I just love the flowers on the plate. This is such a great springtime or summer cup and plate. "It was William McKinley (the 25th president of the USA) who introduced the highly protectionist McKinley Tariff Act of 1890 - this imposed tariffs on many imports (including pottery) in order to make it easier for the American manufacturers to sell their products. It was a requirement of this Act that all such imports carried the name of the country of manufacture. This provided well-known marks such as "Bavaria," "England," "Nippon," - indicating the country of manufacture". England" around 1908/10 and may have used it on some pieces as early as 1898)". 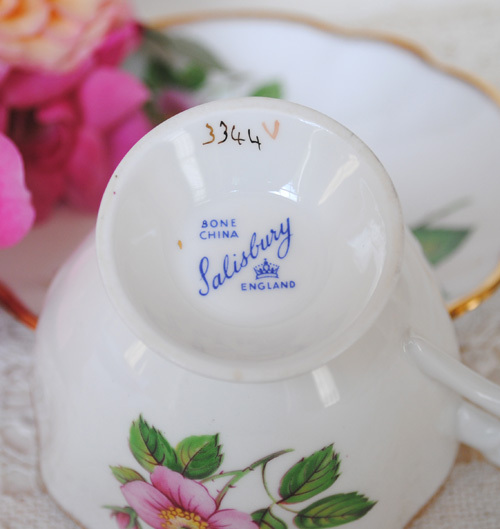 If a backstamp includes "bone china" or "English bone china" it was made in the 20th century. Using this information, I am guessing that my cup was made somewhere between 1900-1921. It doesn't look that old at all! Thank you so much for coming by for a visit today. I appreciate every single one of you! Martha and I love to stop by and visit your place and see what tea cups you have to share. Just fill in the two blanks below in Mr. Linky, and you will automatically be signed up. Please make your tea cup post first and then sign up. Thank you so much, and don't forget to visit Martha, she always has beautiful treasures to share as well as an interesting post. Thank you for the interesting tea and teacup history. Your cup is very pretty and so is the photo styling. WOW, great information Terri! Your research is SO appreciated, too. That cup is just so pretty and the flowers are so crisp against the white background. Another great Teacup Tuesday...you and Martha have created a wonderful place to gather! What a beautiful tea cup & saucer! I am going to have to look for that pattern..thank you for hosting this great event! Very nice teacup and nice story! The brushed gold rim is very pretty. ;-)), but of course have read a bit about tea and grew up between the tea plants. Your tutorial encouraged me to make a scrap bookmark. Well, now that it has been hanging around I say: not so bad, could be better. Thanks for inspiring me! I was surprised to learn bone china really did include ground up animal bones! Thank-you for this bit of history ,I do find it very interesting. Your tea cup is very pretty and one I like very much. The rose is delicate and realistic. I know what you mean about a cup that handles well, or just feels right in your hand and to drink from. Your teacup is very sweet! 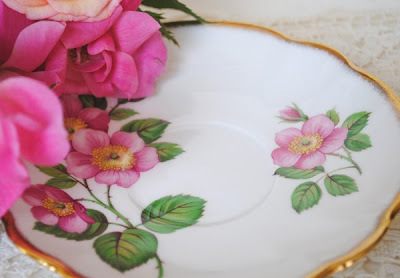 The roses on it remind me of my Therese Bugnet roses, which I shared in my tea post today. I agree, it is the perfect teacup for spring and summer. I so enjoyed reading the history on china teacups and tea itself! Thanks for your visit and I hope you're having a lovely day. That is a very lovely teacup. And I agree with you, it certainly doesn't look that old. Obviously, it was very gently used. Thank you for the tea and teacup information. I always wondered why it was called "bone china." Now I know. Terri that cup and saucer are to die for! So beautiful and I love the way you artfully arranged the setting, so creative and lovely as always! Hi Terri :) Love blogland! You can always learn something new, like your post about the history of the teacup! And your teacup is so pretty! Wishing you a Happy Teacup Tuesday! Ohhh wowwww Terri,this is so beautiful. 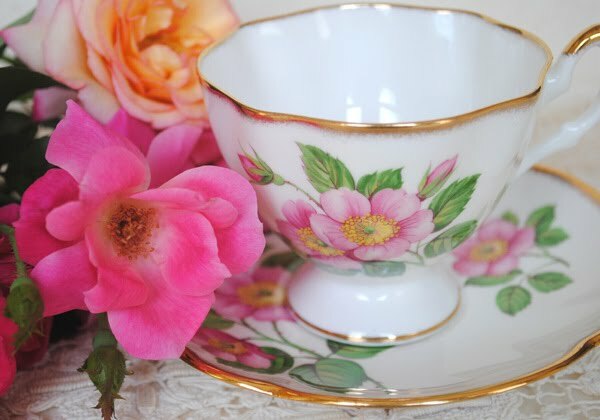 Thanks so much for the informative post on the history of the tea cup!! So interesting!! And what a lovely tea cup!! Perfect for the summer time!! Hello Terri- Thank you for hosting Teacup Tuesday with Martha. 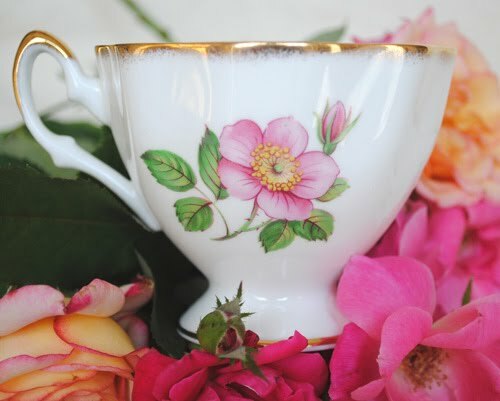 This is a pretty teacup, very striking with it's bright little rose. Salisbury makes such beautiful teacups, I would love to get a hold of one of their 'Foxglove' pieces. Take care. Your cup is very pretty and looks brand new. I thought it was when I saw the photo. I enjoyed that bit of history about the tea cups and factory stamps. Thank you Teri! Your c&s is lovely! Love the wild roses! Thank you to you and Mratha for hosting! this is my first "teacup tuesday" and I'm so excited! A wonderful post! I enjoyed learning these facts about teacups and their markings. I too love the simplicity of your choice this week. The single simple rose pops on the white. Fresh as Spring. Hope to see you at tea. I found this information very interesting, thank you for taking the time to research. I tried to add my url on Marthas page but could not. I had done that last week, is it something I must do each week? Loved the history lesson on tea and tea cups. What a perfect end to my tea filled day. This tea cup is beyond beautiful. Not only do I love the style, the colors and pattern are simply gorgeous. I could stay here all night and admire that lovely design. Your taste in vintage and antiques is simply above reproach. I realize it's late, but hope your tea cup Tuesday was wonderful. Oh love the lesson today! Learned so many things that I did not know. Thanks for researching this. Love floral teacups! Especially roses....but who doesn't ? The rose sitting along side the tea cup is almost identical to the one in the pattern. Really gorgeous and such information!! I never would have guessed that about the 'bone' in bone china. How many teacups would you say you have in your collection at this point? Beautiful tea cup! How interesting to display all of your cups...I love it! Wish I had some. I once collected old powder compacts and hats. I had over 100 compacts and sold them all. I now have a small collection of old purses...the beaded and mesh type...not an expensive lot...just a few I like and some I inherited. I will be on the lookout for old cups. I have just one but I do have an antique tea set my mom handed down to me. Maybe I will post about that some day! Great blog! Beautiful teacup...possibly my favorite so far! Hugs! Bless Dawn for bringing your shoe tutorial to light. I have wanted to feature you as my blog artist and blog of the day ever since I first clicked on you from Marlynn's blog. I have found the perfect match for you, so I am featuring you on Saturday as my blog of the day. I hope you like what I have to share. Thank you for being such an inspiration and having such an awesome blog. I just love all the History! Your Teacup is so lovely! Maybe it is not too late to join you all for tea? French Friday and a Freebie! Tea Cup Tuesday and a Surprise for me. Tea Cup Tuesday from Home!